Most current model drones can now capture video at 4K resolution, at least at 30fps, and some at 60fps. With the increasing popularity of 4K TVs and monitors, and full support for 4K on sharing services like YouTube, it makes a lot of sense to shoot anything you’ll want to keep around for a while at 4K. It will chew up card and disk space quickly, though. You’ll also need to make sure you use a fast enough microSD card. Fortunately, even fast cards have gotten pretty inexpensive. I use SanDisk 32GB Extreme Plus cards ($29.99 @ B&H). I don’t bother with larger cards because I swap the card out after each flight and offload them to my computer every day. If you want to leave the card in the drone over a number of flights, then there is a good deal on Sandisk Extreme Pro 64GB cards for $42 (This is the slightly older UHS-I version, the newer, faster, UHS-II version is $99 @ B&H). Not all drone cameras are created equal though, so you should definitely shoot some test footage at both 4K and more-traditional 1080p to see which one looks better in your particular case. Often you can also use higher frame rates at lower resolutions, so if you want to capture a lot of fast action, or have the ability to create slow motion from your video, then dropping the resolution and increasing the frame rate makes sense. As a general rule of thumb, video looks smoothest when the shutter speed being used is double the frame rate (technically 1 / fps * 2). With traditional cameras this can be accomplished by adjusting the aperture appropriately for the lighting conditions. However, most consumer drones, like most smartphones, have a fixed-aperture camera, so you can’t “stop down” to lower your shutter speed. Instead you need to add a Neutral Density filter in front of the camera to cut out some of the light. The ND filters sold for drones are labeled with the amount of light they let through. For example, an ND4 filter will let 1/4 of the light through, and and ND16 will let 1/16th of the light through. This can be confusing for anyone who is used to seeing ND filters labeled in f-Stops, but is at least simple to understand. On a bright, sunny day, depending on your drone’s aperture and base ISO, you might see a shutter speed of 1/1000, for example. In that case, if you are shooting at 30fps, you’ll want to use an ND16 filter to make your shutter speed approximately 1/60s (1/1000 * 16). PolarPro has a free app to help you calculate this, but as you can see it isn’t very hard. Some drones, especially larger ones like the Phantom family, were designed with filters in mind. Smaller models like the Mavic Pro have lightweight gimbals and are a lot less tolerant of adding the extra payload of a filter. So for the Mavic Pro I recommend using only very light filters, like DJI’s own clip on set for $35, or the very-nicely-crafted PolarPro Cinema Series for $80. Both sets operate correctly with the gimbal. While you’re thinking about filters, you might want to also get versions that include a polarizer, which will help cut through glare and warm up videos on bright days. You can get a 6-pack that includes both regular and polarizing ND filters from PolarPro for $150. Consumer-quality drones are not designed to allow for glossy-smooth camera control. So if you want cinematic-looking sweeping pans or fly overs, you’ll need to ditch the joysticks and turn control over to software. Depending on the brand and model drone you have, the vendor’s own software may provide some scripted modes allowing for Orbits, or Tracking, or even Corkscrews. Many of us have found that we can do a lot more with an add-on product, though. My favorite is Litchi, which is available for most popular drone models. It’ll set you back $25, but if you want to fly sophisticated missions or execute complex movie-like shots, it is money well spent. With it you can even build Waypoint-based routes online using a Google Earth mashup, and then execute them in the field. Of course, you need to be super careful, as there is no guarantee that the elevation information in Google Earth is accurate, and if you are flying a route with trees or other obstacles you need to verify it first before you let your drone loose on it. If you choose to use Litchi, there are some excellent tutorial videos from Laurence Seberini and his Phantom Film School. For basic flying a smartphone is fine. But if you want to plot routes while you’re flying, or simply get a better look at the footage you’re capturing, a quality tablet is really helpful. 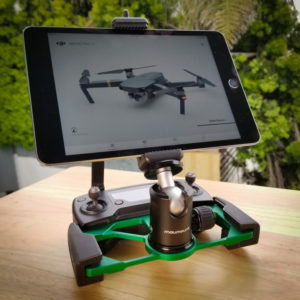 While larger drones like the DJI Phantom Advanced have an easy way to directly mount a tablet, you’ll need some extra hardware to use one with the Mavic Pro. There are a lot of inexpensive solutions out there, and a few on sites like etsy that are quite interesting, but by far the highest-quality I’ve found is the one from MavMount. It is precision machined, offers a variety of ways to configure it, and is rock solid once assembled. You can pick the right size clamp depending on the width of your tablet. 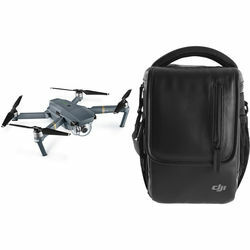 I also like their lanyard and holder, which provide a secure way to let your RC and tablet hang from your neck while you fiddle with your drone. There are a couple quick caveats about using a tablet. Perhaps because of their often higher resolution, it seems to be harder for tablets to keep up with the video feed from the Mavic Pro than for similarly-speced smartphones. So double check that your tablet will let you do the flying you want before you invest in a tablet mount. Also, your tablet may not have cellular connectivity. If not, you’ll need to make sure you download any maps and missions you need before you get out to where you’re flying. Right out of the camera, the Mavic Pro produces very nice video. The color may be a little overdone, but you can fix that by tweaking the Saturation setting a bit. However, if you want professional results, you’re better off shooting in either D-Cine or D-Log and then post processing with a LUT (Look Up Table – essentially a color profile). However, this is a big additional commitment of time and resources, so don’t worry if you’re not ready to take the plunge. If you are you’ll need a full-on video editing package like Final Cut Pro or Adobe Premiere Pro (which I use). You’ll also need some quality LUTs to give you the look you want on your footage. There are some free ones, but you can also get some commercially-supported versions for not that much money. PolarPro sells some, but I’ve had good luck with the $18 package of LUTs and contrast curves from Icarus. If you don’t want to invest in an expensive video editor, the free version of DaVinci Resolve also supports LUTs, although it has some limitations, including not supporting 4K mastering. These tools aren’t directly related to video, but they are helpful for any drone owner doing serious flying. Airmap is a free app that will show you what airspace regulations are in effect where you are planning to fly. Some are pretty obvious, like airports, but there can also be temporary interdictions for wildfires or other emergency activities or large events. Airdata is a logging platform where you can keep track of all your flights, along with the drone’s “black box” logs and calculated weather information. There is a limited free version, or you can subscribe to get more features and manage logs for more drones.